RUGBY UNION: GUY Thompson will make his first start for Wasps in over two months when Northampton Saints visit to the Ricoh Arena in the Aviva Premiership this Sunday. Wasps return back to domestic duties this weekend following last Saturday’s European Champions Cup exit at the hands of Leinster in Dublin. Thompson makes his first start in the pack since returning from a thumb injury, sustained in January, and Ashley Johnson lines up on the blindside flank with James Haskell rested. A re-shuffled backline sees Jimmy Gopperth and Joe Simpson form the half back combination, with Kurtley Beale moving into midfield alongside Elliot Daly. Willie Le Roux switches to fullback, enabling Josh Bassett to return to the wing following strong form this season. Phil Swainston starts at tighthead and Paul Doran Jones provides cover on the bench, having been brought in on a one-week-loan period from Gloucester Rugby, after injuries to Marty Moore, Jake Cooper-Woolley and Simon McIntyre. 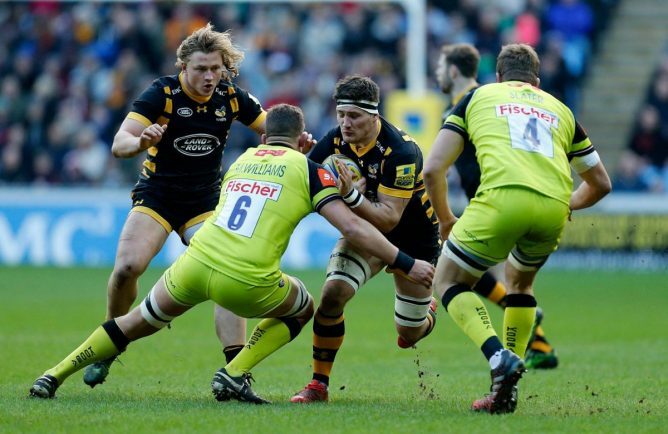 “We’ve needed to put the European disappointment behind us and look ahead quickly as we have a massive game against Northampton Saints this weekend,” said Wasps director of rugby, Dai Young. “Being forced to get back on the horse a week later is probably the best thing that could happen and the positive is, we still have something meaningful to play for and focus on. “We’re in a good place at the top of the league entering the weekend and we want to keep it that way.